Belmont grad Leah Carmean, owner of Baked on 8th bakery, poses in her new store near Belmont University in Nashville, Tennessee, July 31, 2018. The old adage, “From here to anywhere,” can be used to describe so many of Belmont’s graduates, whether they end up in California or China. 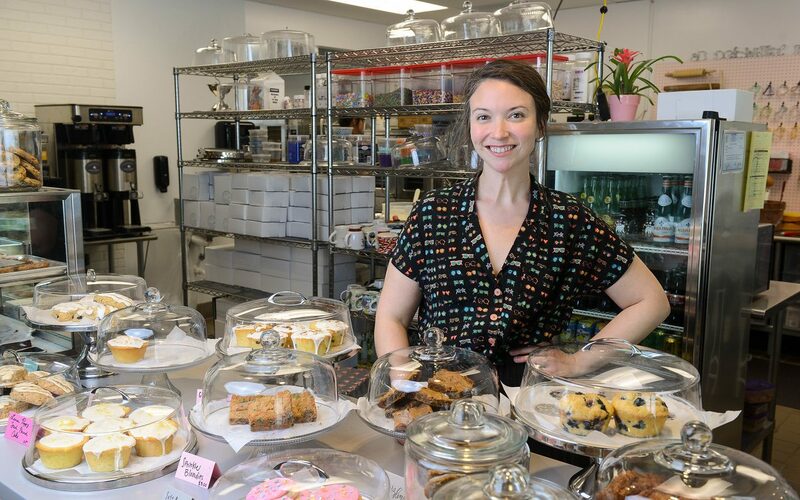 For alumna Leah Carmean, “From here to anywhere” took her just a few blocks away from campus, to 8th Avenue South in Nashville, where she is fulfilling her long-time dream of opening a bakery. Aided by her expertise in entrepreneurship (her major at Belmont), her husband Adam and her love of baking, Carmean’s dream is being realized right down the street from her alma mater. Baked on 8th consists of around 10 employees and is already receiving rave reviews, including this recent Nashville Scene article. The shop focuses on serving cakes, pies and other single-serving desserts in “classic Southern bakery” fashion.